When it comes to living to a ripe old age, humans are up there. Around the world, humans can expect to live at least 40 years, and in some developed countries they can expect to live well into their eighties. That's pretty good in comparison to the rest of the animal world, though some species of tortoise can live well past 100. African elephants have an average lifespan of about 70 years. But fish and various other sea creatures beat all of us terrestrial animals, fins down. Among vertabrates, animals with a backbone, the Bowhead whale's average lifespan is 200 years. At least one koi fish lived to an estimated 226 years. And the Greenland Shark has always been high on the list also with an average lifespan of 200 years. But new research published in Science magazine has pushed the Greenland Shark into the record books as the oldest living vertebrate in the world. The record-breaking research was done by a Julius Nielsen from Denmark along with a huge group of collaborators from the U.S. National Oceanic and Atmospheric Administration and a number of universities. The Greenland Shark is one of the largest fish in the world. It can rival the Great White in size, with females typically growing up to 400 to 500 cm in length. What caught the scientist's eye was that, despite their size, their growth rate is a miniscule, at one centimeter a year. It is one of the few things scientists know about this reclusive arctic predator. Nielsen and his team decided to fill in at least one of those blanks and set out to gauge the lifespan of the shark by radiocarbon dating the eye lenses of 28 female sharks that showed up as unwanted bycatch on fishing boats. The team used what they call a "bomb pulse" as an initial marker to gauge the sharks' age. The pulses are spikes of radiocarbon ejected into the atmosphere by nuclear bomb tests done in the early 1960s. Where these pulses show up on the radiocarbon timeline make them a useful marker to gauge the sharks' real age. 300, 400 years, who's counting? The results were surprising. The ages of the two largest sharks tested were estimated to be well over 335 years, and 392 years give or take 100 years. That clearly makes it the oldest living vertebrate on the planet. 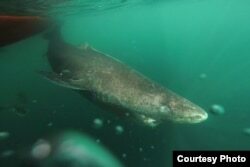 The research also suggested the female Greenland sharks don't reach sexual maturity until they are 150-plus years old. Knowing only that expands what we know about these arctic geriatrics in a big way. And it's not necessarily good news. Late sexual maturity means that the species likely reproduces at a slow rate, and if they are being overfished, their age makes it hard for the population to rebound. 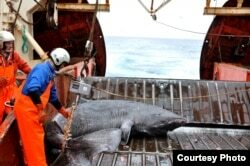 Armed with this new information, the team "strongly suggest a precautionary approach to the conservation of the Greenland shark, because they are common bycatch in arctic and subarctic groundfish fisheries and have been subjected to several recent commercial exploitation initiatives."